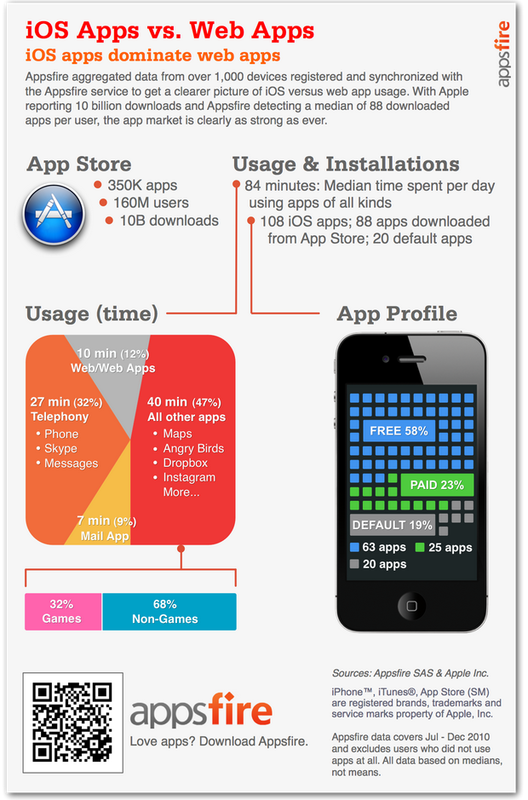 Appsfire, one of the leading mobile app discovery platforms, has analyzed 1,000 devices from its users to gain some insight with regards to the native app vs. Web app debate. It’s 2011, so the research was of course comes accompanied by an infographic. The infographic, which you can find below, is pretty self-explanatory. While Web apps accessed through mobile phones become more powerful every day, native applications still seem to dominate. According to Appsfire, owners of iOS devices typically spend only 10 percent of their time in a mobile browser, inclusive of Web apps. This is in stark contrast to the figure of 50 percent of time spent in native apps, not including the default mail app and other typical telephony apps (mostly pre-installed apps, but also including Skype).